If ever there was an underdog (under root?) of the vegetable world it's celeriac, the knobbly root vegetable that's so often overlooked at the supermarket. And if it does catch our eye, it's because it's so alien looking, covered in obscene appendages, mud-filled crevices and warty protrusions. By appearance alone, celeriac looks neither easy to work with nor enjoyable to taste, so why bother? Because celeriac is actually pretty special. Raw, celeriac has fantastic crunch and a super nutty, celery-like flavour that makes it perfect for salads and slaws. Cooked, it takes on a slight sweetness that works well mashed, baked, roasted or boiled. It all adds up to celeriac being an extraordinarily versatile vegetable that's worth adding to your winter repertoire. For all its gnarly bits, celeriac isn't actually that hard to work with. The key is to not be too precious about losing a bit of the flesh. 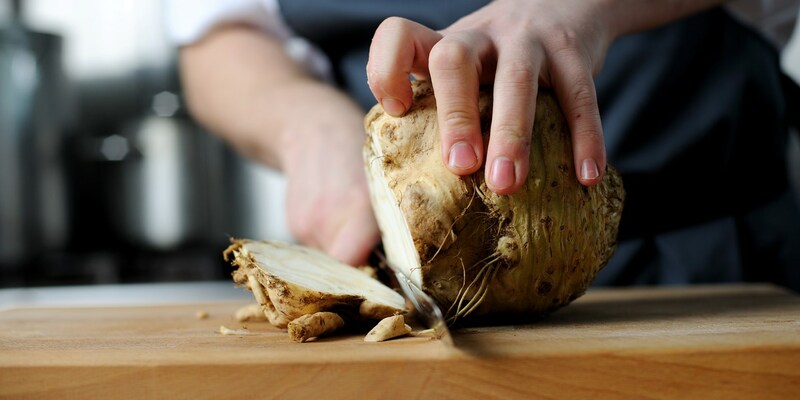 Use a good knife to top and tail the celeriac then continue around the celeriac slicing off the rest of the skin. You can now chop the celeriac into whatever sort of pieces you need: chunks, slices or strips depending on the recipe. Just be aware that celeriac discolours quickly so once sliced, immerse the celeriac pieces into a bowl of water with a squeeze of lemon juice or splash white wine vinegar. Raw celeriac is a great addition to salads. Celeriac remoulade is the classic preparation, a simple salad of celeriac, mayonnaise, mustard and lemon juice. But it's worth branching out and trying some more unusual recipes like Nathan Outlaw’s Root vegetable slaw or Paul Ainsworth’s Celeriac, apple and fennel slaw. Celeriac is worth cooking, as well. You can treat it like any root veg. Roast it as you would potatoes. Boil it and mash it with other root vegetables, or serve it on its own. Celeriac makes a fantastic winter soup too as in Marcello Tully’s Celeriac and blue cheese soup. Or for something totally different, try Paul Foster’s whole celeriac baked in salt crust or Matthew Tomkinson’s Oxtail and celeriac lasagne.